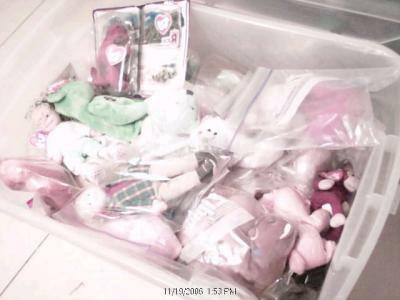 I have about 100 beanie babies at the top of my closet that I would still like to keep in my room, but not out collecting dust. Please tell me some ways I can store them so that they aren't being displayed but also not taking up lots of room. I have heard about but not seen beanie b. storage racks constructed of 2 liter cola bottles, tops cut off, and hot glue. Stack horizontally and glue them brick style. I think two or three babies would fit in each one and you could turn the open end to the wall and cover it to discourage dust. Also, you could see your collection. What about putting up a little hammock in the corner of your room for all the beanie babies to go into? This is what we did with all the stuffed animals in each of the kids' rooms when the kids were still living at home. If you don't want to display them, just throw them in a plastic crate. If you want to display them, put them in clear plastic shoe boxes. Why not use clear plastic bags from buying blankets? Add a dryer sheet and they will be fresh as a daisy when you want to take them out, and more importantly, dust free.